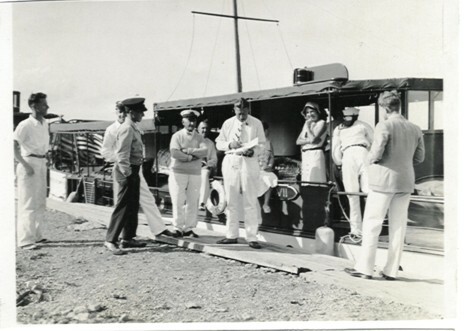 Hello - I was going through some photographs from my family and came upon some prints of photographs that were taken when Count Von Luckner visited with my great grandfather on board his yacht, Topaz VII, in Little Current. 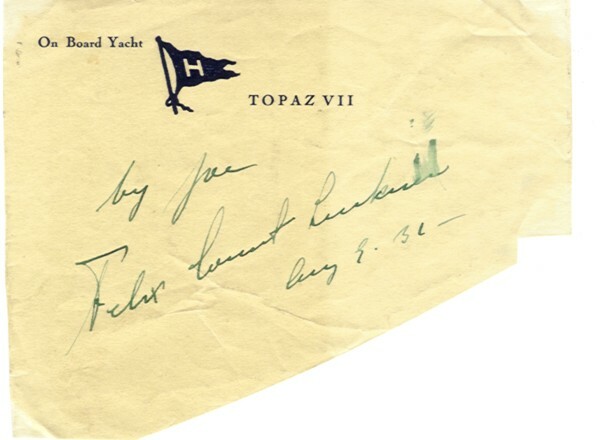 The Topaz sailed out of Rogers City, Michigan with my great grandfather, Paul H. Hoeft, as her Skipper. If you would be interested in seeing a scan of the photo, please let me know. I think your web site is MOST interesting! My thanks for your message and your nice comments about AHOY. Terry Kearns, my friend in Atlanta Georgia, does all the hard work in converting all my writings into the site that shows its face to the world, together we hope to produce something that is of interest to different people. Yes please I would love to have a scan of your photograph, which we would add to that about von Luckner that is already published. He was an amazing character, that certainly rang a bell for many and varied folk across the world. That piece I wrote about him in my Marauders of the Sea in WW1, has probably drawn more response than anything else I have written, and I am continually suprised how he is always elicitating that extra bit of information about his doings from so many people, of which yours is the latest. Again, my thanks for sharing another facet about the COUNT. With best regards and wishes from Terry and myself. Hello once again Mackenzie - I'll attach the photos for you here. 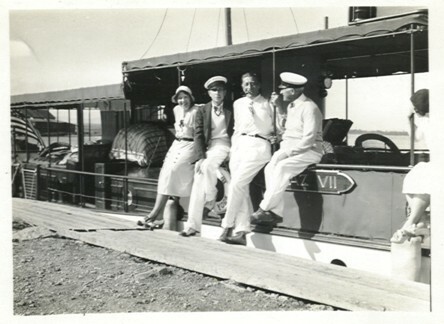 I believe they were taken in 1931, although the ink on the signature in the yacht's log is smudged. Going from family records and other albums, that's my guess. You would probably know, better than I, when Count von Luckner would have been plying the waters near Little Current, Ontario. 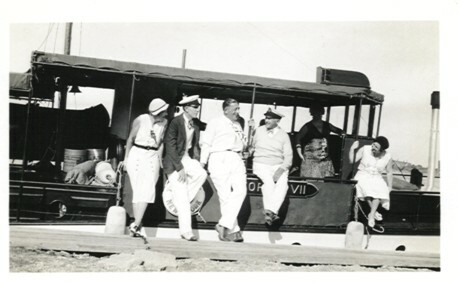 Do you know who captained his yacht for him? I might have a photo of him too! No question that my family, at that time, was totally enamored with the Count. They all were German through and through, speaking the language fluently. My grandfather, Henry Uhl, was a concert baritone and his repertoire included many German songs and he studied voice for many years in Dresden. Colorful history, made even more colorful by such an illustrious visitor! Best to you and thank you for informing us and making the world a more interesting place!